SUBMIT YOUR APPLICATION PHOTO AND STORY TODAY! Submit your photo(s) to the Grace Engineered Products LinkedIn page under the Grace Photo Contest post. Enter for a chance to win a $150 Amazon Gift Card! All Grace Engineered Products customers, distributors, and sales reps are encouraged to enter early and often! 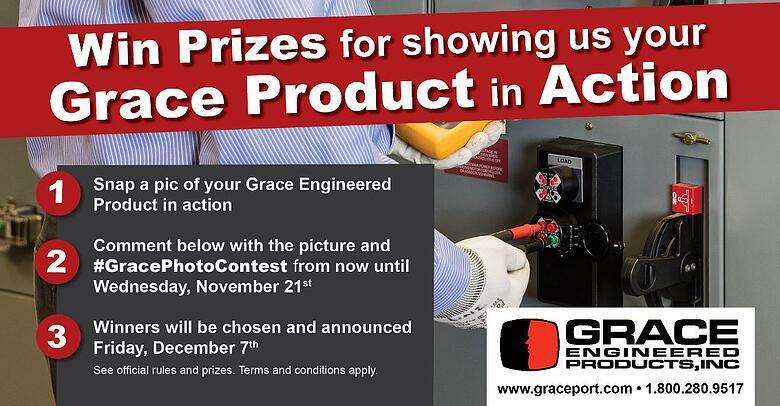 Enter Now until Nov. 21st via the Grace Engineered Products LinkedIn Page. Please post all application photos under the photo contest image posted on the page using hashtag #GracePhotoContest. Winners will be announced via LinkedIn on December 7th. The more photos you enter the better! Take several shots of each application and post them on Grace LinkedIn page under Photo Contest post using #GracePhotoContest hashtag to increase your chances of winning. Final submitted photos must be in a .jpeg or .tiff format with a minimum size of 8x10 at 300 dpi resolution preferred. To initially submit and participate in the contest please visit Grace's LinkedIn Page. Submit an image of your installed GracePort® or Permanent Electrical Safety Device (PESD) by commenting in the comments of the contest post, using the hashtag #GracePhotoContest to qualify. A brief description of the application with customer name and location is required if you are selected as a finalist. Photos may not be digitally altered or otherwise enhanced. Anyone age 18 and over may enter. Grace Engineered Products employees are not eligible to win. Gift cards will be sent through email to the winners. We will gather contact information when reaching out directly via social media. Winning entries will be displayed on the Grace website and social media platforms. With your submission, you consent to allow Grace Engineered Products to publish these photos with proprietary rights in printed or digital promotional materials including, but not limited to, the Grace website, social media, and any other means of promotion. Winners will be chosen by members of the Grace Engineered Products sales & marketing team and announced on social media December 7th. Individual winners will also be notified directly via social media.